Asked to name one Greek god or goddess and most people are going to say the name of Zeus; and most people will consider him to be the most powerful god of the Greek pantheon. Zeus though, was of course only the third supreme ruler of the Greek pantheon, for he was preceded by his father Cronus, and his grandfather Ouranus. Zeus was born the sixth child of Cronus and his wife Rhea; and so Zeus was brother to Hades, Poseidon, Hera, Demeter and Hestia. Being born to Cronus though, did not give Zeus a privileged position, and it was more likely to find him imprisoned, for Cronus was fearful of his own children overthrowing him. This had meant that the previous children of Cronus and Rhea, and found themselves imprisoned in the stomach of Cronus. This was a fate that awaited Zeus as well, but Rhea and Gaia managed to substitute a clothed stone for the baby Zeus, and Zeus was secreted away to Crete without Cronus being aware of the substitution. To ensure that Cronus never became aware of the deceit undertaken by his wife, care for the newborn Zeus was given over to the nymph Amalthea, and the child was hidden in a cave on Mount Ida. Inside the cave, Zeus' cradle was suspended so that it was neither on the earth or in the sky, places where Cronus would have become aware of his son; additionally to drown out any crying from the baby, Korybantes would dance and bang drums and their shields. So on Crete, Zeus was allowed to grow to maturity in secret. A prophecy had already been made about a child of Cronus overthrowing his father, and Zeus would ensure that this prophecy came true. Zeus' grandmother, Gaia, would guide him, and so in the first stage of the uprising, a poison would be concocted, which ensured, when drunk by Cronus, that his would regurgitate the five siblings of Zeus imprisoned within his stomach. Next Zeus would travel deep into the depths of Tartarus, and after killing the dragon Kampe, Zeus would release his uncles, the three Cyclopes, and the three Hecatonchires, from their own imprisonment. Zeus now had a fighting force to usurp his father. From Mount Olympus, Zeus would lead Hades, Poseidon and his allies in a ten year war against Cronus and the Titans, the Titanomachy; and of course Zeus was ultimately successful, and Cronus and the other Titans were appropriately punished. A decision then had to be made about the division of the cosmos, and so Zeus, Hades and Poseidon would draw lots. Subsequently, Hades would be given dominion over the Underworld, Poseidon the world's waters, and Zeus was given heavens and earth; this of course made Zeus the most visible of all gods, and therefore he would become regarded as the supreme deity of the Greek pantheon. Many surviving texts of Greek mythology tend not to focus on the rule of Zeus, but instead tell in detail of the love life of Zeus; and of course, Zeus had plenty of lovers, both mortal and immortal, to ensure that many stories could be told. In general, Zeus is considered to have been married three times; the first wife of Zeus being the Oceanid Metis, the second wife of Zeus being the Oceanid Euronyme, and the third wife of Zeus being the most famous, for this wife was Hera. Zeus though was never a faithful husband, and Hera in particular would spend much of her time dealing with Zeus' infidelity. 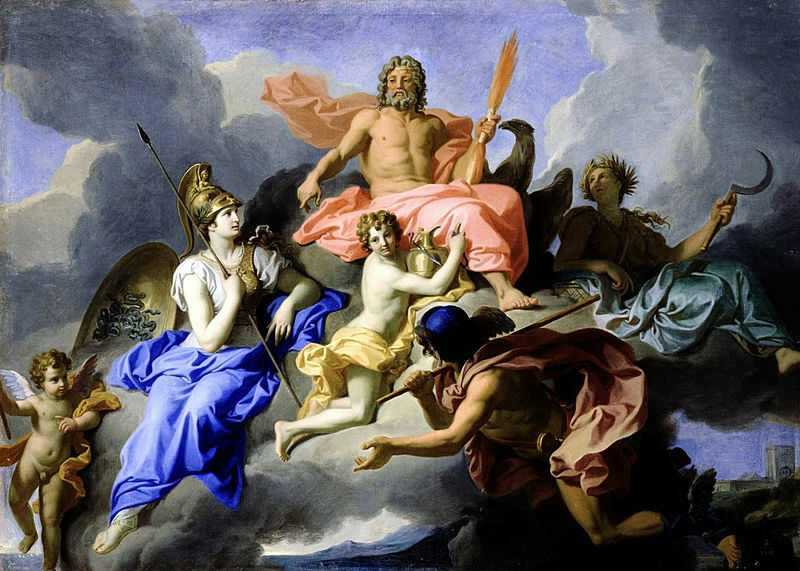 Zeus would abduct the Phoenician princess Europa and take her to Crete to have his way with her; and this brief relationship would bring forth three sons for Zeus, Minos, Sarpedon and Rhadamanthus. Another famous son of Zeus, Perseus, was born when Zeus came to Danae in the form of golden rain. A famous story about Zeus' love life though sees the god not consummate the relationship, for when it was told that the son of Thetis would become more powerful than his father, Zeus promptly had the Nereid married off to the mortal Peleus. The son of Peleus would become more powerful than his father, but he was no threat to Zeus, for that son was Achilles. Other mortal or demi-god children of Zeus would include Heracles, Dardanus, Helen of Troy, Lacedaemon and Tantalus; whilst immortal children included Moirai, the Charities, the Muses, Persephone, and Nemesis. Zeus would form a council of 12 on Mount Olympus from his own family members, and these would become the 12 Olympians - The original twelve were; the siblings of Zeus, Poseidon, Hera, Hestia, and Demeter; Zeus’ aunt, Aphrodite; and some of his offspring, Athena, Apollo, Artemis, Ares, Hephaestus, and Hermes. Zeus did occasionally have to make time away from his love life to deal with challenges to his rule. Famously, the giants, the Gigantes, were pushed into action against Zeus and the other gods of Mount Olympus by Gaia; and whilst Zeus and the other gods were eventually successful, it was only really with the help of Zeus own son, Heracles, that victory was assured. Zeus had even fewer allies though when it came to facing the monstrous Typhon and Echidna, and it was only in final battle to the death against Typhon that Zeus came through the challenge. Challenges to the rule of Zeus though were not always from outside Mount Olympus, and at various points Hera, Apollo and Poseidon all plotted against Zeus. Even more worrying to Zeus that the acts of other gods was the actions of man. For although Zeus had commanded Prometheus to make mankind, he would eventually bring forth the destruction of most of mankind, firstly introducing Pandora and her box to mankind, and then sending the Deluge to kill off everyone else. Only a handful of people would survive the flood, including Deucalion and Pyrrha, but eventually the planet was repopulated. In a similar way, Zeus would bring forth the Trojan War to bring an end to the time of heroes.